My [deficit reduction] plan is very similar to the Simpson-Bowles plan," Mitt Romney told talk-show host Sean Hannity on Aug. 2. This was a radio interview, so there is no way of knowing whether Hannity fell off his chair, laughing uncontrollably. We do know that Hannity did not ask Romney, "You mean you want to raise $2 trillion in taxes over the next 10 years?" Nor did he ask, "You mean you want to tax capital gains at the same rate as ordinary income?" Nor, "You mean you want to cut defense spending deeper than the President does?" Hannity just let it slide, yet another embarrassing moment in Romney's Summer Horribilis. The man continues to be at war with his own mouth. But, you might well ask, what about that other candidate, the Obama guy? Simpson-Bowles was his commission to study the federal government's long-term structural deficit, and he famously refused to endorse its findings. Not exactly a profile in courage either, right? Well, yes and no. First, let's put former Republican Senator Alan Simpson and former Clinton chief of staff Erskine Bowles and their report to rest. Practically no one, except the terminally high-minded financial elites, endorsed this plan. None of the House Republicans on the commission, including Congressman Paul Ryan, endorsed it. Only 38 members of the House of Representatives favored it when it came to a vote--and it was largely a symbolic gesture for most of those voting aye. That's not to say Simpson-Bowles is a bad plan. It's a pretty good one, as is the less official Rivlin-Domenici proposal that came out about the same time. But it is not a perfect plan. There are details, like the defense cuts or the limitation of the mortgage-interest and charitable tax deductions, that are way too broad-brush for any sane politician to support without seeing how they fit into a larger package. 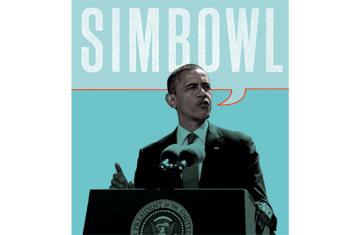 In point of fact, "Simpson-Bowles" has become a symbol, or SimBowl, rather than an actual plan, political shorthand for the process of long-term deficit reduction. Does the President support "Simpson-Bowles"? Yes. He's said so many times. And he's even been willing to act on it. In July 2011, he came very close to making a SimBowlic deal with House Speaker John Boehner to cut $3 trillion-plus from the deficit over the next 10 years. Boehner had committed to $800 billion in revenue increases, mostly loophole closings; the President had committed to significant, if not earth-shattering, cuts in entitlements. Specifically, he agreed to raise the age of Medicare eligibility and to change the way the consumer price index is calculated for Social Security recipients, to reduce the annual inflation adjustments. Both of these are as unpalatable to most Democrats as the $800 billion in new revenue is to Republicans. The Obama-Boehner deal collapsed in a blizzard of recriminations. The Boehner folks said, accurately, that Obama had moved the goal posts, raising the revenue target to $1.2 trillion after the initial deal was done, to appease Senate Democrats, who'd been cut out of the process. The Obama folks said Boehner couldn't have delivered even on the $800 billion, given the rantings of the Tea Partyers. "He couldn't deliver a pizza," an Administration aide said. Both sides should be given some credit for trying, but not too much. Their failure certainly puts the political impossibility of the real Simpson-Bowles into context.